Home insurance, also commonly called hazard insurance or homeowner's insurance (often abbreviated in the real estate industry as HOI), is the type of property insurance that covers private homes. 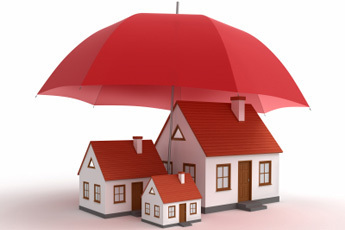 It is an insurance policy that combines various personal insurance protections, which can include losses occurring to one's home, its contents, loss of its use (additional living expenses), or loss of other personal possessions of the homeowner, as well as liability insurance for accidents that may happen at the home or at the hands of the homeowner within the policy territory. It requires that at least one of the named insureds occupies the home. The dwelling policy (DP) is similar, but used for residences which don't qualify for various reasons, such as vacancy/non-occupancy, seasonal/secondary residence, or age. The home insurance policy is usually a term contract-a contract that is in effect for a fixed period of time. The payment the insured makes to the insurer is called the premium. The insured must pay the insurer the premium each term. Most insurers charge a lower premium if it appears less likely the home will be damaged or destroyed: for example, if the house is situated next to a fire station; if the house is equipped with fire sprinklers and fire alarms; or if the house exhibits wind mitigation measures, such as hurricane shutters. Perpetual insurance, which is a type of home insurance without a fixed term, can also be obtained in certain areas.